The Hinsdale Central Holiday Classic joined the Christmas Holiday circuit in 2015 with a sixteen team field. Participating in the initial tournament were: Crespi Carmelite of Encino, California, Crete-Monee, DePaul College Prep, Foreman, Hinsdale Central, Homewood-Flossmoor, Hope Academy, Lincoln Park, Maine South, Perspectives Math & Science Academy, Richards, Rockford Auburn, Saint Charles East, Stevenson, Urban Prep Englewood and Westinghouse. The grouping featured two defending state championship teams in Crespi Carmelite and Stevenson. So finally after 20 months of planning, the opening tip-off of the inaugural Hinsdale Central Holiday Classic was underway, but those that wanted a speedy outcome of Game One had to wait an extra period, as Richards – thanks to a ferocious 28-13 fourth quarter comeback – defeated Hope Academy 74-67 in overtime. The extra session was an indication of what was to come quite frequently on that very first day as three games went into overtime and one of them lasted two extra periods. The Stevenson Patriots lived up to their top billing building a 22-6 lead after one quarter en route to an 80-48 victory over Foreman. Homewood-Flossmoor survived a stubborn Lincoln Park squad as Kendric Pryor made three free throws with three seconds left, as the Vikings won 47-44. Rockford Auburn’s Trevon Tyler scored 36 points as the Knights defeated Westinghouse 83-69. Overtime game number two took place with DePaul College Prep knocking off Saint Charles East 50-47 in an extra session and Maine South coasted in their 56-42 win over Urban Prep Englewood. The host Hinsdale Central Red Devils made the most of their home court and took two overtimes to outlast Crete-Monee 66-59. And despite traveling over 1700 miles earlier that morning, Crespi Carmelite shook off any jet lag in defeating Perspectives MSA 68-42. On day two, consolation quarterfinal wins were recorded by Foreman, Lincoln Park, Saint Charles East and Crete-Monee. In the championship quarterfinals, Stevenson became the first team to punch a ticket to the Final Four by outscoring Richards 41-15 in the second half on their way to a 72-41 victory. 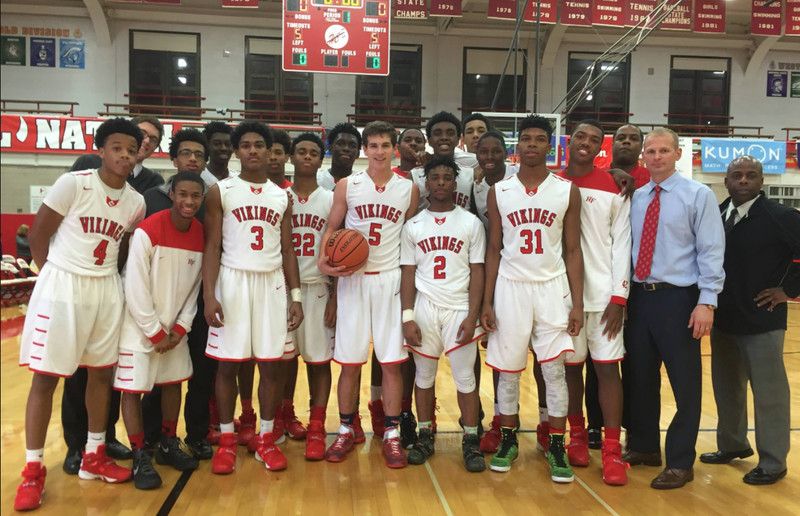 Homewood-Flossmoor recorded their 1,000 victory in their program’s history beating Rockford Auburn 61-45. Maine South scored the first nine points of the fourth quarter to defeat DePaul College Prep 40-36 and Crespi Carmelite built a 19-point halftime advantage and withstood a second-half rally by Hinsdale Central to secure a 61-52 win. Crete-Monee’s Jeremiah Matthews equaled the three-day old single game scoring record of 36 points in his team’s 75-65 victory over Saint Charles East in the consolation semi-finals. Lincoln Park defeated Foreman 50-32 to advance to the consolation final. Rockford Auburn bested Richards 80-51 and Hinsdale Central made 13-of-15 second half free throws to move on to the fifth place game in their 46-43 victory over DePaul College Prep. The championship semifinals saw Homewood-Flossmoor knock off defending Illinois state champion Stevenson 55-51 to reach the inaugural title game, as the Vikings’ bench outscored the Patriots 27-13. Stevenson shot 1-of-15 from outside the three point arc. The other semifinal saw the defending California state champion advance to the championship with a 45-37 victory over Maine South. The Hawks also shot 1-of-15 from the three-point stripe. Crete-Monee won the Consolation Championship by defeating Lincoln Park 50-43. 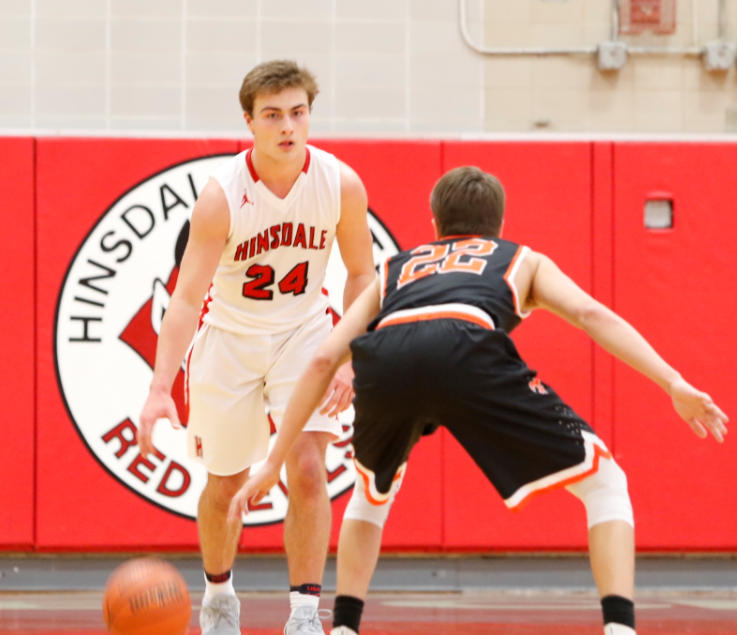 An exciting Fifth Place final saw the tournament’s fourth overtime contest, as Hinsdale Central upended Rockford Auburn 72-70. Travon Tyler scored 32 points for Auburn and Peter Blust added 27 for Central. Brad Perry scored the game winning lay-up with less than a second remaining to give Maine South a 48-46 victory over Stevenson in the Third Place game. 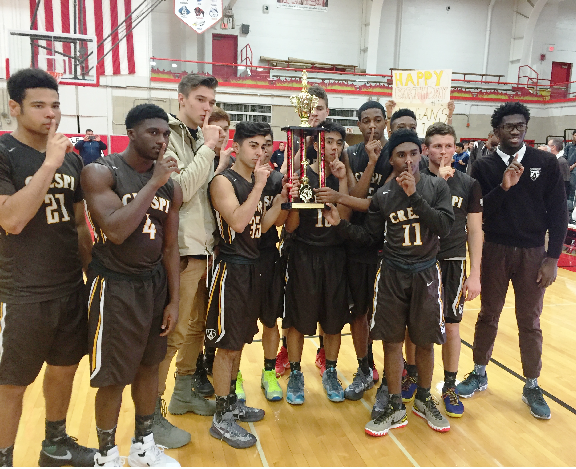 Crespi Carmelite captured the first ever HC Squared championship trophy with a 50-41 victory over Homewood-Flossmoor. Tournament Most Valuable Player, and University of Southern California bound, De’Anthony Melton led the Celts with 22 points and six rebounds. Crespi broke a 34-34 tie with a 15-0 run highlighted by Melton’s 12 points during that stretch. The tournament champions won four games and never trailed one second in any of their contests. Along with Melton, Crete’s Jeremiah Matthews, Homewood-Flossmoor’s Kendric Pryor, Stevenson’s Justin Smith and Auburn’s Trayvon Tyler were named to the Classic’s first team All-Tournament squad. Four new teams entered the Hinsdale Central Holiday Classic in 2016: Bolingbrook, Glenbrook North, Marian Catholic and Saint Viator. The 16 teams represented 15 different conferences. Round One for Year Two saw Lincoln Park upend Saint Charles East 62-44 in the tourney opener. Marian Catholic and Urban Prep Englewood saw the lead change hands 12 times in the second half before the Spartans recorded a 65-54 victory. Westinghouse dealt Maine South a 42-33 defeat leading wire-to-wire. Rockford Auburn advanced to the quarterfinals for the second straight year by topping Richards 84-63. Homewood-Flossmoor scored the game’s first 13 points and never looked back as they beat Saint Viator 55-38. Hinsdale Central stunned Stevenson 47-42 in an opening round upset sealing the victory with six straight free throws. And the opening round nightcap saw DePaul College Prep hold off Crete-Monee 74-69. Saint Charles East, Maine South, Saint Viator and Stevenson all had consolation quarterfinal victories on Day Two. Marian Catholic won another nail biter, 51-49 as Lincoln Park missed three shots in the final minute to either tie or take the lead. Number-one seed and unbeaten Bolingbrook survived an upset bid from Westinghouse with a 53-46 victory. The game saw nine lead changes and 16 ties before the Raiders pulled away late. Homewood-Flossmoor made it two Final Four appearances in as many years with their 41-26 win over Rockford Auburn, as the Knights went scoreless than final seven minutes of the game. And in a game that just would not end, DePaul College Prep outlasted Hinsdale Central 64-62 in six overtimes. The Rams’ Matthew Tonkel had a tip-in at the end of the tenth period to decide the contest. The marathon was the 14th longest game in IHSA history. The Red Devils’ Jack Hoiberg scored 32 points in a losing effort. Saint Charles East beat Maine South 50-41 and Stevenson defeated Saint Viator 57-22 to both move on to the Consolation Championship. Westinghouse outscored Lincoln Park 34-18 in the second half in their 52-42 win to advance in fifth place bracket play. Hinsdale Central defeated Rockford Auburn 56-51 in the other half of the fifth place bracket. Bolingbrook secured a spot in the title contest with a 59-44 victory over Marian Catholic. The Raiders used a 15-0 in the fourth quarter run to seal the victory as Malik Binns recorded a double-double with 23 points and 12 rebounds. Homewood-Flossmoor used deja vu to advance to the Hinsdale Central Holiday Classic championship game for the second straight year, in the Vikings 41-40 win against DePaul College Prep. Jeffrey Boyd tallied 16 points for H-F.
Stevenson claimed the Consolation Championship trophy with their 56-41 victory over Saint Charles East. After their opening round loss the Patriots won their last three games by a collective 69 points. Corinthian Fields hit a game winning jumper with five seconds remaining to give Westinghouse a 39-37 win over Hinsdale Central in the Fifth Place game. Marian Catholic defeated a sluggish DePaul College Prep team 57-41 to capture the Third Place trophy. The Spartans shot 56 percent from the floor and the Rams connected on only 38 percent of their shots from the field. 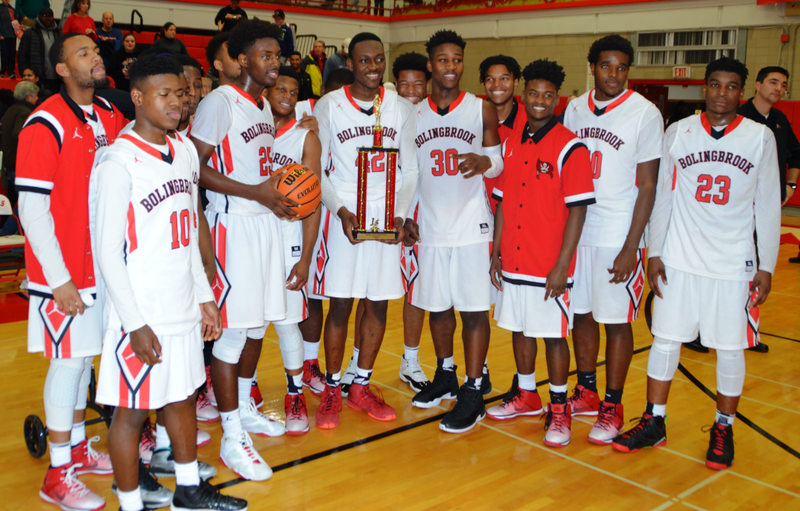 Bolingbrook jumped out to an early start and held off a fourth quarter rally by Homewood-Flossmoor to win the championship game of the 2016 Hinsdale Central Holiday Classic by a score of 67-62. Opening up a commanding 24-point lead in the fourth quarter, Bolingbrook withstood a strong comeback charge by the Vikings. H-F cut the lead to four points before the Raiders ran out the clock and claimed their first HC Squared title in their first year of competition. Tournament Most Valuable Player Nana Akenten scored a team-high 23 points in the finale and added 13 rebounds to secure a double-double. Bolingbrook shot 56% from the floor and outscored Homewood-Flossmoor 34-20 in the paint. For the tournament Akenten played 104 minutes and never made a turnover. Joining Akenten on the first-team All-Tournament Team was teammate Malik Binns, Chase Adams of Marian Catholic, Justin Hardy of Saint Charles East and Justin Smith of Stevenson. Saint Rita was the lone new addition to the tournament field for 2017. DePaul Prep was anxious to start the tournament, but had to wait a few extra minutes as the Crete-Monee bus arrived late delaying the start of third annual Holiday Classic. The Rams got back on schedule in the second quarter and outscored the Warriors 18-3 in the second eight minutes en route to a 43-30 victory. Stevenson erased a 10-point halftime deficit to stun Homewood-Flossmoor 48-47. Jackson Qualley and Nick Bonk combined for 13 fourth quarter points for the Patriots. 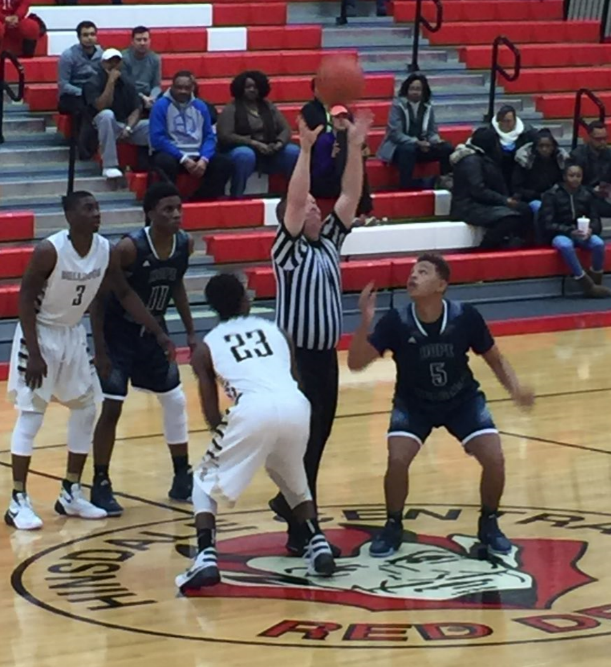 Saint Rita outlasted Westinghouse 60-53, outscoring the Warriors 19-8 in the final quarter. Saint Rita turned 18 offensive rebounds into 21 second chance points. Maine South scored the game's first 15 points and never looked back in their 62-49 win over Richards. Rockford Auburn advanced to the winners bracket for the third straight year defeating Glenbrook North 50-40. The Knights opened the game with a 12-2 run. Defending HCHC champ Bolingbrook won their fifth game in as many tries at Hinsdale with a 53-36 triumph over previously undefeated Urban Prep Englewood. 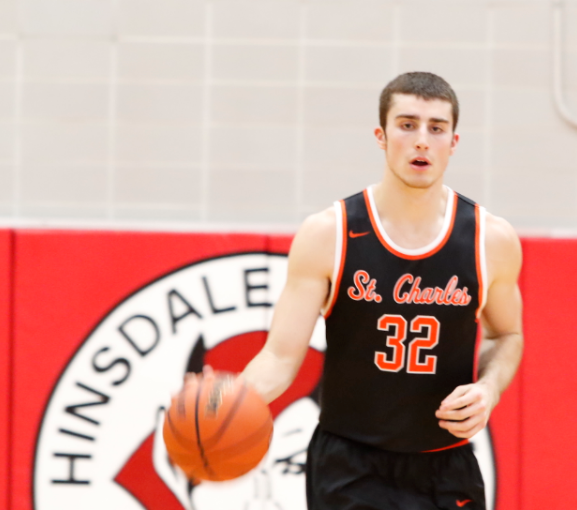 Saint Charles East edged the host Hinsdale Central Red Devils 70-68 in two overtimes. In the second extra period Saint Charles' Justin Hardy's two hand slam, with 25 seconds remaining, gave the Saints a lead the would never relinquish. Terrence Shannon's 26-point performance led Lincoln Park to a 67-61 upset first round victory over Marian Catholic. Homewood-Flossmoor, Westinghouse, Glenbrook North and Marian Catholic won second round consolation bracket contests. In winners' bracket action, DePaul Prep advanced to the Final Four for the second straight year in their 49-36 victory over Stevenson. The Rams held Stevenson to 9-for-32 shooting from the floor and 2-of-12 from the three-point arc. Saint Rita posted their second straight comeback victory defeating Maine South 48-43. The Hawks started out red hot with a 19-8 first quarter advantage. The Mustangs took the lead for good in the fourth quarter, finishing the game on 12-0 run. Bolingbrook opened the quarterfinal game against Rockford Auburn with a 15-4 run to start the game. Tyler Cochran scored a game high 22 for the Raiders, who outrebounded the Knights 46-28. Lincoln Park built a sixteen-point lead with two minutes remaining in the game, before Saint Charles East pulled within three in a ferocious comeback which just fell short, as the Lions prevailed 76-73. Both teams brought their "A" games on offense, as Lincoln park shot 64 percent from the field and the Saints tallied a 63 percent success mark from the floor. South suburban rivals Homewood-Flossmoor and Marian Catholic both posted consolation bracket victories. Maine South ousted Stevenson 66-64 in double overtime and Saint Charles beat Rockford Auburn 61-35 in the fifth place bracket. 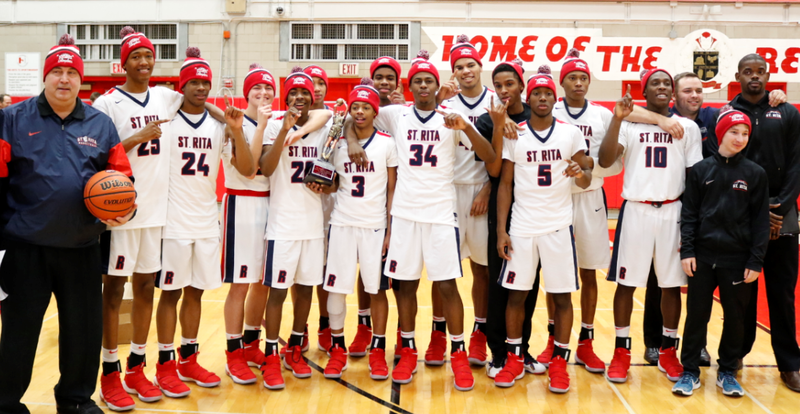 In a semi-final match up pitting two teams from the Chicago Catholic League, first time HCHC entrant Saint Rita advanced to the championship game by defeating DePaul Prep 56-37. The Mustangs had eight players put points on the scoreboard and were led by Javon Cooley who scored 15 points off the bench. DePaul's Raheem Anthony tallied 15 points for the Rams. Bolingbrook made it to the HCHC championship game for the second straight year in their 59-56 victory over Lincoln Park. The Raiders guard tandem of Kaleb Thornton and Joseph Yesufu combine for 28 points. Chris Roberts paced Lincoln Park with 20 points. Marian Catholic opened their Consolation Championship game with 11-3 run to start the game versus Homewood-Flossmoor and never trailed. The Spartans Ahron Ulis scored 17 points and was a perfect 11-for-11 at the free throw line. Maine South captured the fifth place trophy by defeating Saint Charles East 80-67. The Hawks Essam Hamwi scored 27 points in the victory. Saint Charles' Justin Hardy scored a game-high 28 points and furthered his all-time HCHC career scoring mark of 233 points over the past three years. Lincoln Park recorded a wire-to-wire victory over DePaul Prep in the third place game. Terence Shannon had a double-double with 18 points and 13 rebounds. The third annual Hinsdale Central Holiday Classic championship followed the usual come-from-behind script for Saint Rita. Bolingbrook built a 34-25 halftime lead, thanks to five three-point baskets in the first quarter. But in typical fashion the Mustangs came back, starting the second half on a 11-2 run to pull even at 36-36. The lead changed hands three times at the start of the fourth quarter until Saint Rita pulled ahead for good on a Joel Watts three-pointer with five minutes to play. The Musatngs shot 41 percent from the floor but were an impressive 77 percent from the free throw line. Watts scored 13 for Saint Rita and Tyler Cochran led the Raiders with 14 points and 10 rebounds. Saint Rita entered the tournament with a losing 5-7 win-loss record and recorded four victories in four days to claim the title in their first attempt. 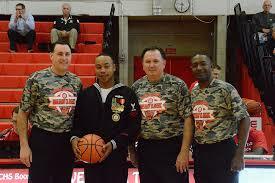 Saint Rita's Jordan Matthews was named the tournament's Most Valuable Player. The remainder of the first team of the All-Tournament Team included Tyler Cochran of Bolingbrook; Essam Hamwi of Maine South; Justin Hardy of Saint Charles East; and Terence Shannon of Lincoln Park. Oswego East and Willowbrook were added to the tournament, giving the sixteen-team field representation from 15 different conferences. Coming into the tournament, nine different teams were ranked in the Chicagoland area. In a battle between two teams that were both in the rankings, Willowbrook out pointed Richards 66-61 as Everett Stubbefield and Matas Masys combined for 48 points for the winners. Marian Catholic lived up to their lofty expectations by defeating Glenbrook North 67-47, and shot 64% from the field. Mark Musial's three-pointer with 20 seconds remaining lifted Saint Charles East past Stevenson 51-48. And top-seed DePaul Prep had little trouble with Urban Prep Englewood in their 60-29 victory. In a game that featured 15 lead changes and eight ties, Saint Rita outlasted Rockford Auburn 54-52. The Mustangs won their fifth game in five attempts in tournament and history and the Knights were dealt their first-ever first round loss. Ray J Dennis and Kamron Battle combined for 52 points in Oswego East's 89-71 victory over Westinghouse. Devin Davis added 30 points for the Warriors. Homewood-Flossmoor lead wire-to-wire in their 52-40 win over Hinsdale Central, limiting the Red Devils to only 29% shooting from the floor. And in the second game of the opening round which featured a match up of two ranked teams, Lincoln Park held off a fourth quarter rally by Maine South to win 46-43. In Day Two action, Richards, Stevenson, Rockford Auburn and Hinsdale Central recorded second round consolation bracket victories. Marian Catholic advanced to the semifinals by defeating Willowbrook 58-54, and shot 53% from the floor. DePaul Prep outscored Saint Charles East 30-19 in the second half to advanced to the Final Four for the third straight year. Lance Moseley tallied 21 points, including 5-of-6 shooting from three-point range, for the Rams. Oswego secured a semifinal spot by ousting Saint Rita 66-55. It was the Mustangs first loss in two years at HCHC. Homewood-Flossmoor defeated Lincoln Park 34-33 in the last quarterfinal, as the Vikings outscored the Lions 22-10 in the paint. Stevenson and Hinsdale Central both recorded consolation bracket victories and advanced to a title game on the left side of the bracket. Yemi Eitulo tipped home the game winner (his only points of the game) before time expired to lead Marian Catholic to a 44-42 semifinal victory over DePaul Prep. The Rams opened up a 31-23 lead in the third quarter, but Marian went on a 10-0 run to give the Spartans a 42-37 lead with two minutes remaining. Lance Moseley hit a 3-pointer and Perry Cowan added a jumper to tie the game with 40 seconds left, before Marian held for the last shot. Marian advanced to their first championship game in HCHC tournament history. Isaac Stanback had a double-double with 23 points and 15 rebounds, as Homewood-Flossmoor advanced past Oswego East 69-55 in semifinal #2. The Vikings scored the first eight points of the game and never trailed. Oswego's Ray J Dennis, who scored 57 points in his first two games, was held scoreless in the first half. Homewood-Flossmoor would be making their third appearance in the championship game of the Hinsdale Central Holiday Classic over the past four years. Stevenson took a 15-5 first quarter advantage on its way to a 60-37 Consolation Championship victory over host Hinsdale Central. The Patriots shot 61% from the floor in the win. Saint Rita used a 10-0 fourth quarter run to pull away from Saint Charles East and earn a 49-36 victory in the Fifth Place Game. The Mustangs, who have won 7 of their 8 games played at the HCHCH, were led by Joel Watts who tallied 13 points. Oswego East took home the third place trophy in their first ever showing at HCHC, and upended DePaul Prep 58-55 in double overtime. Ray J Dennis scored 24 points in the contest and established the all-time single-season tournament scoring record with 98 points over four games. DePaul's Perry Cowan finished his HCHC career with 16 points. Cowan, who played in 16 HCHC tournament games over the past four years, was named to his third straight All-Tournament Team. DePaul Prep finished in fourth place for the third straight year. In a rematch of a game held earlier in the year, Marian Catholic captured their first HCHC crown, by defeating Homewood-Flossmoor 52-45 in the championship game. Marian built a two-point halftime advantage and then went on a 11-0 run in the third quarter to break open the deadlock. The game featured defense around the basket, as the teams combined for an all-time tournament record 24 blocked shots. Tournament MVP Ahron Ulis lead the Spartans with 17 points. Marian Catholic's Ahron Ulis and Christopher White; DePaul Prep's Perry Cowan; Oswego East's Ray J Dennis and Homewood-Flossmoor's Isaac Stanback were named to the first team of the All-Tourney squad. 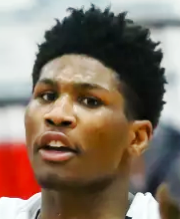 Kamron Battle, Oswego East; Devin Davis, Westinghouse; Lance Moseley, DePaul Prep; RJ Ogom, Homewood-Flossmoor; and Nate Oritiz, Saint Charles East, rounded out the second team All-Tournament Team.